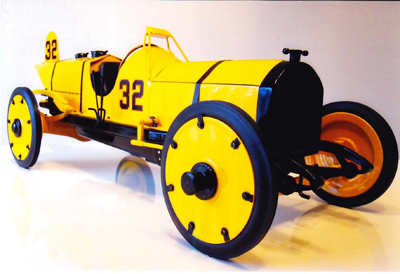 Height: 7 3/4" Length: 24" Width: 9"
Handcrafted by John Snowberger, son of famed Indy great Russ Snowberger. 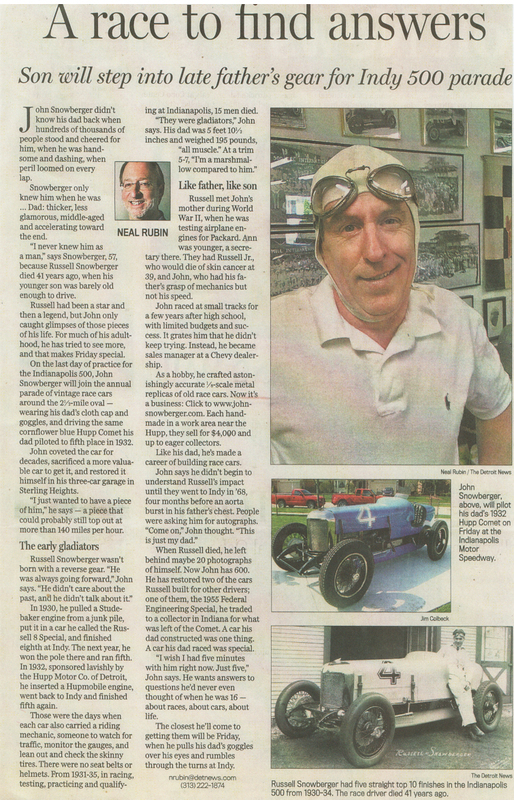 For 2011 we celebrate the 100th anniversary of the first Indianapolis 500 mile race. 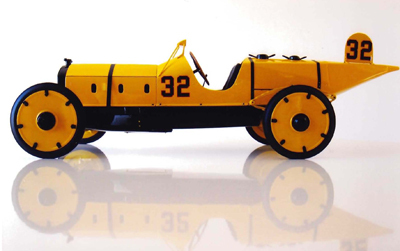 Driver Ray Harroun crossed the finish line first driving the Marmon Wasp to victory. A modified Marmon 32 passenger car had been nick-named the "Wasp" because of its yellow and black paint along with its distinctive pointed tail. Harroun was the only solo drive of the forty car field, all other's had riding mechanics. Harroun has an idea to concoct a mirror above the cowl to see what was going on around him. Replacing the extra weight of a riding mechanic and saving fuel in the long race. Officials gave Harroun the okay to use the mirror, thus the rear veiw mirror was born. 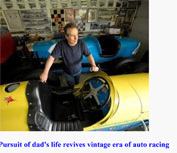 A lot has changed in auto racing since Harrouns near seven hour grueling win at an average speed of 74.602 mph. 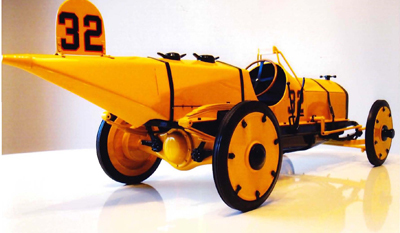 One thing has remained the same, the Marmon Wasp is the crown jewel of the Indianpolis Motor Speedway Collection. No other race car has or ever will equal this historic icon. Even the United States Post Office is commemorating a special postage stam this year with the Marmon Wasp. 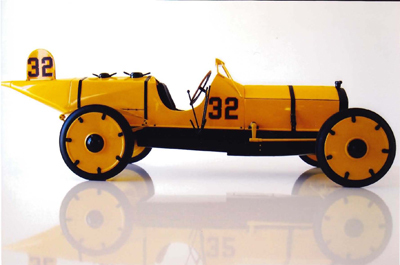 To hand-crafte each model with accuracy, John is using prints of the Marmon Wasp done by Bob Clidinst who had complete access to the car at IMS spending countless hours on the project to assure its preciseness. Each car will be numbered and autographed by John Snowberger. An absolute museum piece, this is a once in a lifetime offeer on a first come basis. Make the Marmon Wasp the crown jewel of your collection!